In the afternoon of Saturday November 21, search and rescue volunteers from from numerous California Mountain Rescue Association teams were flown to Meysan Lake to continue the search for Michael Meyers. 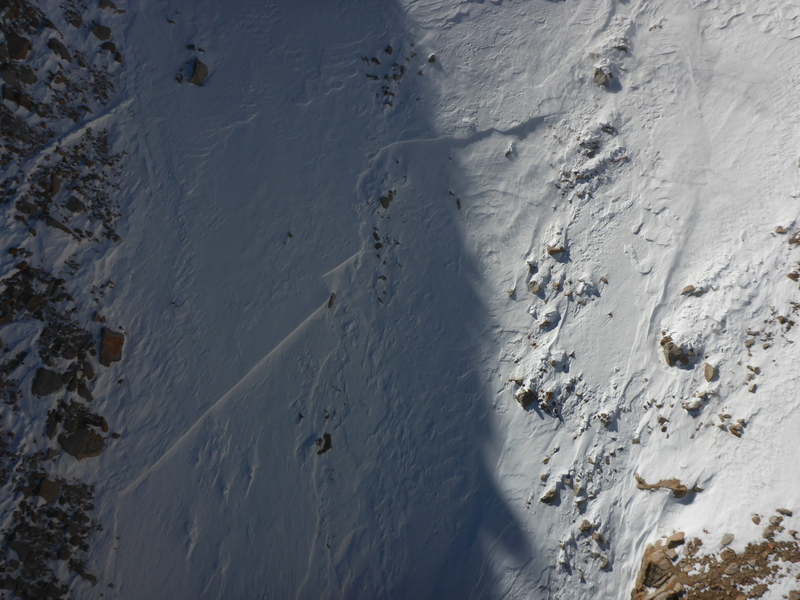 Based on the location of the helmet that was located and recovered on November 20, teams planned to search avalanche debris in the vicinity of the helmet using avalanche dogs, RECCO avalanche search technology, and avalanche probes. 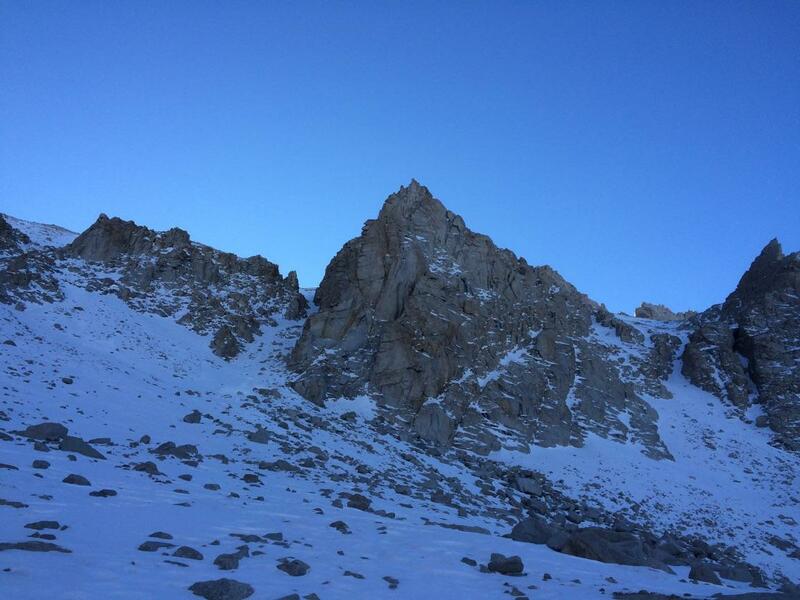 SAR personnel were also assigned to search the snow and rock filled chute above the location of the helmet, and to act as safety lookouts. 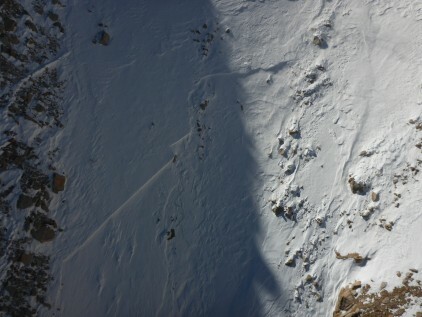 The RECCO device located Mr. Meyers buried in approximately two feet of avalanche debris near the toe of the avalanche accumulation zone, approximately thirty feet down-slope and lookers-left of the location of the helmet, and approximately 400 feet in elevation above Meysan Lake. Mr. Meyers was deceased. It appeared that he either was caught by an avalanche from above while in the chute, or triggered an avalanche near the top of the chute and was carried down (searchers on the day prior reported an avalanche crown abovethe top of the chute). It was unclear whether Mr. Meyers was ascending or descending when the accident occurred. 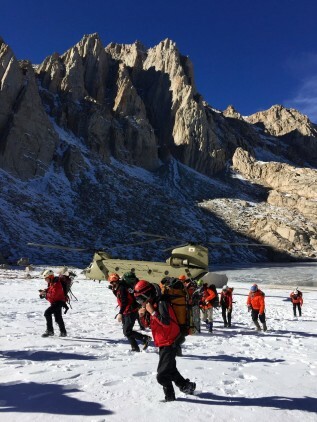 Mr. Meyers’ remains were carried to the helicopter landing zone at Meysan lake and flown to the Lone Pine Airport, where they were turned over to the Inyo County Corner. Inyo County Search and Rescue thanks Mono County Search and Rescue, China Lake Mountain Rescue Group, Kern Valley SAR, Sierra Madre Search and Rescue, Los Angeles County Search and Rescue, Bay Area Mountain Rescue Unit, Marin County Search and Rescue, San Diego Search and Rescue, Montrose Search and Rescue, Wilderness Finders Search Dog Teams -WOOF, the California Rescue Dog Association (CARDA), and the California Army National Guard Bravo Company for their assistance in completing this mission. Posted in 2015, Missions Reports, Most Memorable.